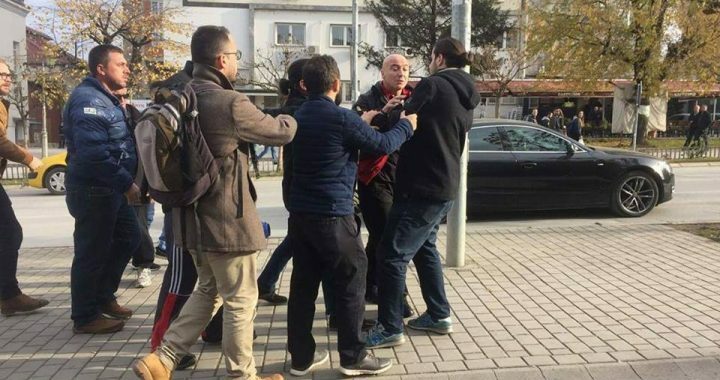 On November 11, Taulant Osmani, a BIRN Kosovo Journalist, was verbally abused and threatened with physical attack during a protest in Gjilan against the relocation of a monument dedicated to the fallen of the 1941-1945 Anti-Fascist War. Osmani was covering the protest, following his earlier reporting on the tense debate between Gjilan’s residents, governance, and civil society regarding the monument’s relocation. A statue of early-twentieth-century Albanian military leader Idriz Seferi is being erected in its original place. Osmani was recording a heated discussion among individuals debating the differing sides when one of the discussants asked him why was he filming, while two others tried to attack him and take his phone. “As a journalist, in order to portray how polarized citizens are regarding this issue, I started filming their debate. The person reacted aggressively with words, he verbally attacked me asking why I’m filming. In that moment, two other individuals intervened by shoving me, cursing at me and grabbing my phone,” Osmani explained. Osmani said he does not know what would have happened if other residents would not have intervened. BIRN journalist Taulant Osmani reported the case to the police, and the Kosovo Association of Journalists, AGK, condemned the attempted attack.